A good interface is a thousand details done right. The difference between a good interface and a great one is in those details: the spelling of a word, the spacing between items, colors used and so on. There’s – literally – thousands of details that are important. In the last document on ITS, I wrote about how to create an internet service, an ICF service for it and ITS templates for the screens: Internet Transaction Server (ITS) mobile – Developing ITS templates from scratch. In this document, I want to help you get the details right for the ITS HTML screens – creating themes as per your company standards, making them user-friendly and legible. 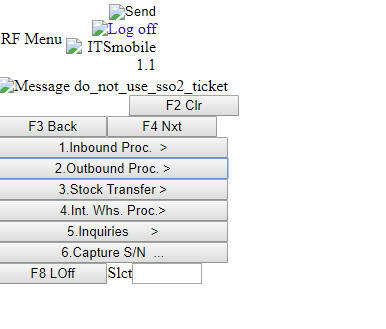 Recently, SAP has come up with the ITSmobile Visual Editor to make screen modifications and styling much simpler. However, if you cannot use it given the pre-requisite considerations concerning the support packages, you may proceed as below. Of course, these can also be defined as service parameters in se80 for that particular internet service. However, they will be treated as ‘default’ files for styling. The files that are referred to within the template are given preference if there is more than 1 CSS file or JS file or Voice file applicable for that service. Create a folder path: THEMES/ALL with a CSS file (mobile.css) and a GIF file (ALOGO.GIF) under it. Please note that the outer-most folder (in this case, THEME) does not get upload in the MIME folder. Also, please use GIF file types only for logo other images as other types do not work. Allow default read and write access to this folder and the files in it. Copy CSS code from mobile.css file of itsmobile service. You can modify the design later as you please – copying the old classes to form new ones, modifying them as required and then using the new class names. 2. Execute report siac_upload -> At selection screen, choose last tab strip “Objects of a Theme”-> Give your service name and theme. Choose radio-button Mime Objects (Language-Independent) -> Execute (F8). 3. Choose the created directory ‘THEMES’ which contains the mime objects -> Press OK. In this case, the files and folder structure below the THEMES folder will get uploaded in the MIME repository for the internet service ZUK_MOB. 4. Choose the package and the transport. If there are a lot of files to be uploaded, this may take some time. 6. We will also create an HTML file ‘CUAAREA2.HTML’ under the HTML templates for the service. 7. Give the package name and transport. 8. The default HTML file gets generated. For now, let us overwrite it with the code of CUAAREA.HTML file of the itsmobile service. 9. We are done with uploading the files. Now, let us start linking to these files and making modifications as required. They can be Sound, CSS or JS files as highlighted above. Take the default file from the ‘itsmobile’ service from the given path. Declare a variable cssinclude that points to our file and give that for the ‘name’ attribute for the ‘current_service’. Save and publish it. Remember to save and publish it. And voila! The body color is green (CSS file acknowledged) and the SAP logo is replaced by our logo (CUAAREA file acknowledged). In this way, we can play around with our CSS and HTML files to apply styling. Once we establish our final CSS and CUAAREA file, we can have a company specific theme for our pages. We can also arrange the various elements on a screen using the normal <TABLE><TR><TD> tags or any other valid HTML tags for that matter. Using custom JS files, we can also have client-side field validations, if required. For more information about HTML, CSS or JS syntaxes, you can visit W3Schools website. I have developed the Module pool screen and deployed in ITS service. 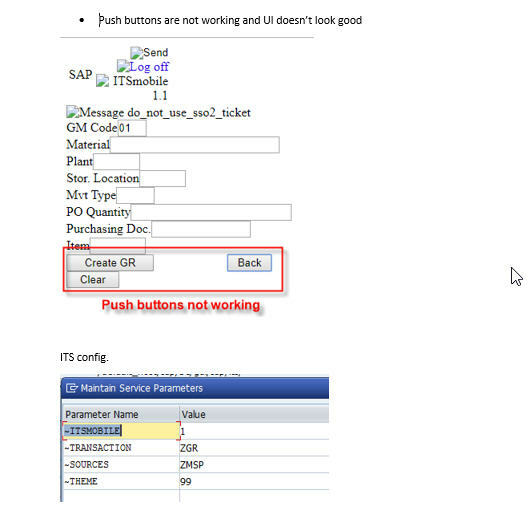 Is there any option or parameters need to be maintained go get user interface ? Yes. Refer to the above document to modify the CSS file for the styling. And for any more specific questions, please open a new thread. I read this entire blog, but it did not help me to solve screen resolution problem, hence need help. Issue: For LM12 transaction I have used standard HTML template like, SAPLLMOB and Screen 2056. It has its own HTML , where I could not find a place , where I can go and change height and width which can be applicable to entire screen and will adjust as per device. I have configured the services properly and I can see the LM12 screen in IE and on device also. Device is Intermec. but the problem is with resolution. The LM12 screen is getting displayed in one left hand side top corner. I want to display it on whole screen, that is, need to adjust as per screen resolution. and play around with the display to suit your requirements. The class is mentioned against the ‘class’ attribute of the body tag in your HTML template. However, it is better to create a new custom class, add it in your CSS file and then give that file name in the attribute of your body tag. I have just created Mycuaarea.html just as a copy of ITSMOBILE cuaarea, when I change de default cuaarea in the page template form standar to mycuaarea and publish it I get error. I have created the new custom module pool program,created new ITS service and published. When I test in SAP it words fine but when I test in browser Push buttons doesn’t work and UI doesn’t look good in chrome browser but looks cool in IE. Even Standard Menu Push buttons are not working and I have tried to put external break point and also hard break point break-point. when I check it from browser debugger is not getting triggered. and also I see send and images not getting displayed.